Lean boneless strip steaks (also called club steaks) are used here, but other steaks such as tenderloin or sirloin can be substituted. The Gorgonzola sauce can be made ahead and stored airtight in the refrigerator up to 3 days. Bring it to room temperature before serving. Make the sauce: In a small bowl, combine the Gorgonzola and vinegar. Mash with a fork until almost creamy (some lumps will remain). Stir in the olive oil and sour cream until blended. Stir in the parsley and season to taste with salt and pepper. Generously season the steaks on both sides with the salt and pepper. In a heavy large skillet, heat the oil over medium-high heat. Add the steaks and cook for 4 to 5 minutes on each side for medium-rare, or 5 to 6 minutes for medium. Transfer the steaks to serving plates and let rest for 5 minutes. Spoon the sauce over the steaks or serve on the side. 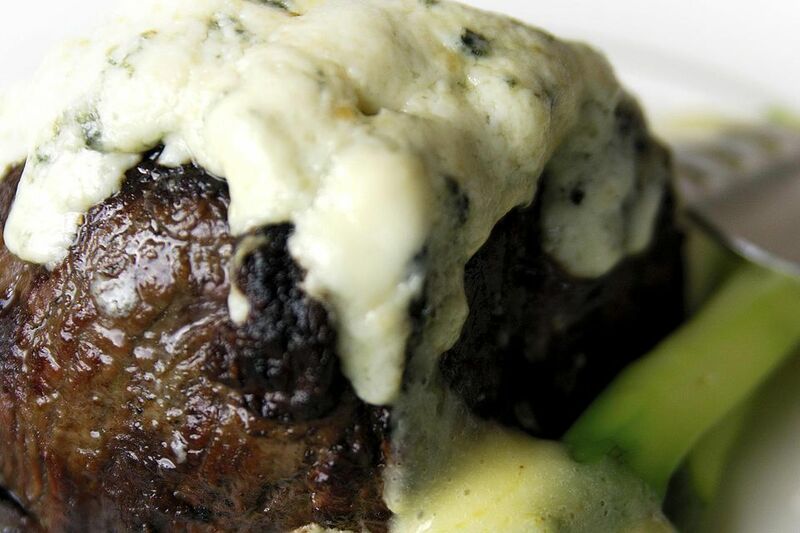 Gorgonzola sauce is great on these steaks, but also try it on pasta, chicken, or pork. It is important to let the steaks rest for about 5 minutes after they've been cooked and before you serve them. The cooling-off period gives the juices a chance to evenly distribute throughout the meat, as they tend to migrate to the center while being cooked. This will keep the meat juicy and tender, and when you cut it, the juices won't run all over the cutting board. When buying Gorgonzola cheese, buy it in small quantities and try to consume it within 2 to 3 days. If the cheese is wrapped in plastic when you purchase it, rewrap it when you get home in waxed or parchment paper. It is recommended to store cheese at a temperature between 35 F and 45 F with a high humidity, such as the lower fruit or vegetable drawer of a refrigerator. In general, never freeze cheese, as the texture will deteriorate quickly and it may lose some of its flavors. If you need to grate, shred, or crumble cheese, it's best to do this while the cheese is very cold. A general rule is that 4 ounces of ungrated cheese will yield 1 cup of grated cheese.